I am over-dramatising just a tad. Storm Gareth which has bashed Britain this week has only meant stormy interludes of rain and wind here- the rain part being very very welcome. Inbetween, although we are back to winter temperatures, there have been passing sunny periods, with intense blue sky. Not wet enough yet to start spreading the mulch I have been saving, but nearly- I may just spread it anyway at the weekend. The poor old garden doesn’t know whether it’s coming or going as we plunge back to frosty nights and cold winds- but for most plants, they are now committed to beginning spring growth whatever happens. I have been nursing a shoulder injury since before Christmas, hoping that time will do the trick. Turns out to be a tendon injury in two arm muscles- good job Alison- so I am grounded from gardening whilst the anti-inflammatories have a chance to work on those pesky tendons. So, gently swinging the camera in the other hand, I am just looking at the moment. Boldly appearing in February, so far only 3 flowerheads on this beautiful wild anemone, Anemone fulgens x Multipetala have opened, and been a little rain-dashed for their trouble. But, this great plant is such a joy, bringing postbox red to spring, and gently spreading beyond the three expensive bulbs that I planted 3 years ago. I have tried so hard to source the fantastic red bergenia, Bergenia ‘Irish Crimson’, that I saw in Dan Pearson’s gardens near Kings Cross two years ago. No luck in France, and I am not such a prolific plant smuggler as I used to be. But this could get pretty close. I am trying out Bergenia ‘Eden’s Dark Margin’ and also Bergenia ‘Wintermärchen’ in a couple of places on the moister side in the garden. So far, ‘Wintermärchen’ is more upright, with narrower, more pointed leaves and has already lost the redder tinge to the leaves that it had in January. Whereas, the dumpier ‘Eden’s Dark Margin’ is still glowing crimson. Also starring Sophora ‘Sun King’ in full bloom on the left, the unveiled new path curves sinuously round the side of the hot, dry border taking you on a full circuit of the house if you wish. I love it. I wasn’t sure before we did it, but keeping the angle of the curve and making it frame the dry border was a brilliant move- thank you Jim. Molly the dog has other ideas and uses her own track as you can see- more direct and less messing! By the way, if you are willing to wait, Sophora ‘Sun King’ bought in a 9cm pot and planted in a sunny, free draining spot, will only take 4-5 years to be a decent-sized shrub, and after that, it can gallop. The above is an experiment, which I think will work. I have planted spring flowering white Muscari, Muscari botryoides ‘Album’, in some rubbish soil at the edge of the Stumpery. We will see. I am hopeful. I am really hopeless at remembering bulb names. Mainly I suspect because I have a tendency to think of them as an after-thought to the main show. Daft. Because right now they are the main show. So I can’t tell you what this very baroque variety is. But here is a mutant variation. Commitment to Spring has even started with my baby Koelreuteria paniculata ‘Coral Sun’, so hurry up tendons. 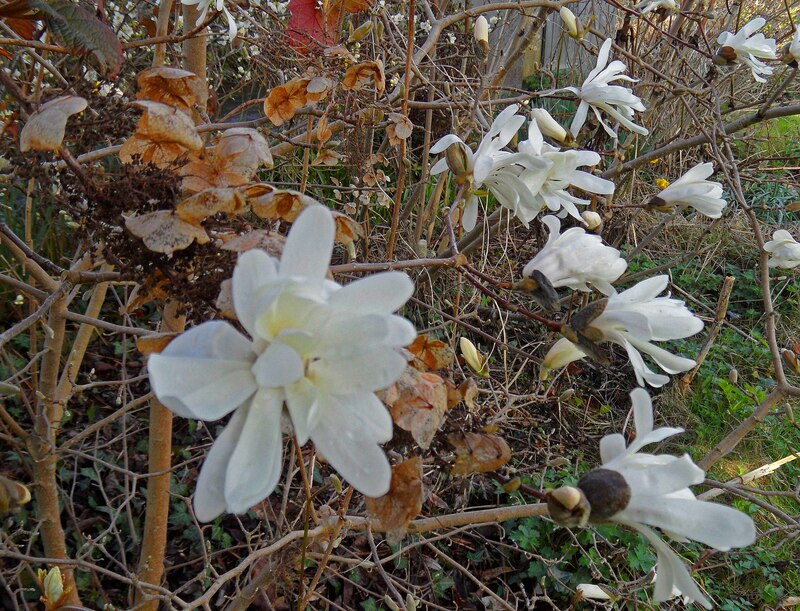 Strange how the cold breeze ruffled some of the new flowers on the Magnolia stellata, but not others- and with no windbreak either. The weather is bouncing quixotically from 2C in the morning, to 21C, and then greying over in the afternoon with a cold wind- which accounts for the fact that most things are biding their time for more stable temperatures- but it is Skegness-bracing for us humans- and the ground is slowly regaining malleability as the torrential rain seems to have stopped. Only small moments are happening in the garden- human activity is focusing on big-weed removal, like dandelions where I don’t want them- they can help themselves to the ‘lawn’ in my view. Personally, I wouldn’t grace our mossy and dry, how can it be both?, grass with the term ‘lawn’. But then again, I’m not that bothered about lawn-stuff. My eyes glaze over when Monty Don starts on about lawns and grass. I rather like the delicacy of this little tulip. I have a feeling that I should have planted them deeper, I will try and remedy that for next year. 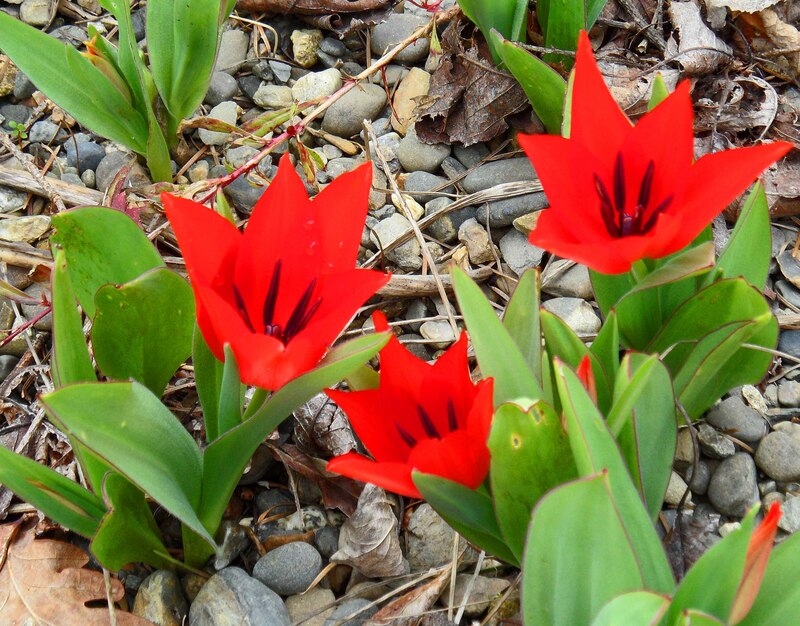 I bought a handful of Tulipa clusiana ‘Lady Jane’ in the autumn, as an experiment. Of course, I had forgotten where I had planted them, and then I had also done a massive clearout of the vicinity, which may have disturbed them a bit. So they are a bit on the wobbly side. I had a go at tucking them up a bit more with some pale gravel, which does set them off quite well but may not really help anything. Let’s hope that they are tougher than they look. If there is enough sunshine, the flowers open wide to show thick chocolate stamens and a splash of liquid gold at the centre. I think, though, that I like the half-open position, so that the soft pink contrasts with the white of the flower. Continuing with the pale and delicate theme, these daffodils have graced me with a return this year. I think I have to review my bulb purchasing. The last couple of years, tulip and narcissus bulbs have done very poorly for me, despite growing them in pots with sharp sand to help with drainage. So, last autumn, I just threw some old bulbs into the ground, thinking, ‘Fat chance’. But, there they are. Looking back, I think I have named this variety properly, but carelessness abounds. By contrast, these daffs, from a purchase last autumn, have positively shocked me with their Disneyland colouring. I am sure that these were meant to be cream with an orange trumpet, a sort of extra-frilly one, but you need your sunglasses on for these. With a name like ‘Chantilly’, you would expect cream, wouldn’t you?! The white Japanese quince, Chaenomeles speciosa ‘Nivalis’, was pretty nipped by the frost the other week, but bolstered by a background show from the Magnolia stellata, was giving a final show. I rather liked the impressionistic feel of the breeze through the blossom. But for more to happen, we must wait more. A beautiful installation at the Garden Musuem, London last month took my fancy on a wintry day. Called ‘The Vitrine’ and made by Rebecca Louise Law, it is a simply gorgeous copper wire suspension and arrangement of flowers. Here is the view from one side, and, with reflections, from the other side. Magical. Last weekend, I saw the gardens of the Musée du Quai Branly in Paris. The Musuem was opened in 2006 and is Paris’ newest museum, dedicated to the indigenous art and culture of Africa, Asia, Oceania and the Americas. Jacques Chirac’s parting project from his Presidency, it is a bold and dynamic modern building designed by Jean Nouvel, the great French architect. Wrapped around the building is a large and wandering garden space, protected by glass walls on the river Seine side of the site. The garden space was designed by Gilles Clément, with an extra feature designed by Patrick Blanc, of which more later. This garden space is open, inclusive and very, very clever. Paths set off with no particular place to go, meandering between curving plantings of magnolia and other human-sized trees, inviting you to weave in amongst the planting without any requirement to obey. The cleverness is created by the sweeping, swerving repeat planting of grasses, euphorbias and other not particularly special plants. Nothing here for the plant snob, which, to my mind, simply evokes movement and freedom from rules. It makes no-one feel small because they don’t know the Latin name of the plant. In fact, I saw no plant tags at all. I’m not saying that identifying something is intrinsically a problem- just that sometimes in some gardens, identification can verge on the encouragement of snobbery. And in a very public space, where the object is to encourage wandering in the open air and the noticing of natural beauty, such simplicity supports rather than detracts. Sadly, the grasses had just been pruned! But you can imagine…. And you can feel this in the Museum garden space. It stands out as simple and compelling. Strolling in the garden, these beautiful Magnolia stellata, some white and some the less often-grown pink, were flowering sublimely as the light in the afternoon faded. They were planted close to the path, one even had an obliging manhole cover right next to it that I hopped onto, to get closer. So he meant it about brushing against the garden. And meantime, back in Tostat, a week later, my Magnolia is just venturing out, looking rather Japanese, I thought. I had forgotten- as I am not a great list-maker- that I had bought these and actually planted them where they want to be. 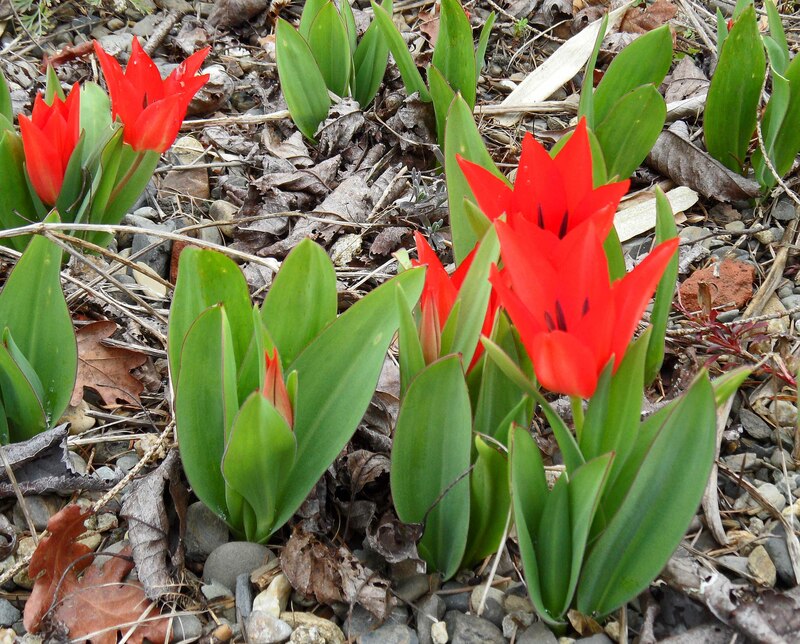 Species tulips are small gems, which generally prefer gravelly, well-drained conditions and then they must be left alone. Very slowly, they will clump up and come back each year, as long as you remember where they are, and don’t stick a fork through them when dormant. They withstand poor weather pretty well with their stumpy legs, and so are ideal for times of low morale, like these. Pillarbox-red doesn’t get close to the brilliance of the red. I didn’t buy these from Avon Bulbs, but I could have, and Avon Bulbs always have a stand to remember in the big tent at Chelsea. The link shows you their display which won a Gold again. And there you can see from the planting list, Tulipa Abu Hassan, which I have often read about and coveted. It’s a normal tulip, if you see what I mean, and it is quite gorgeous. And the name is enough for me! And, whilst bumbling about outside, surely one of the finest activities in the garden, the sun came out and, for about half an hour, Spring was back. You could almost hear the energy in the garden changing. Blooming for once at the same time as the white Japanese quince, Magnolia stellata, the only magnolia I grow, had burst its buds. Looking for all the world as if a flock of tiny doves had landed in the garden, it is a delight right now. Against the papery last-year flowers of the Hydrangea quercifolia, it brings real life into the garden. 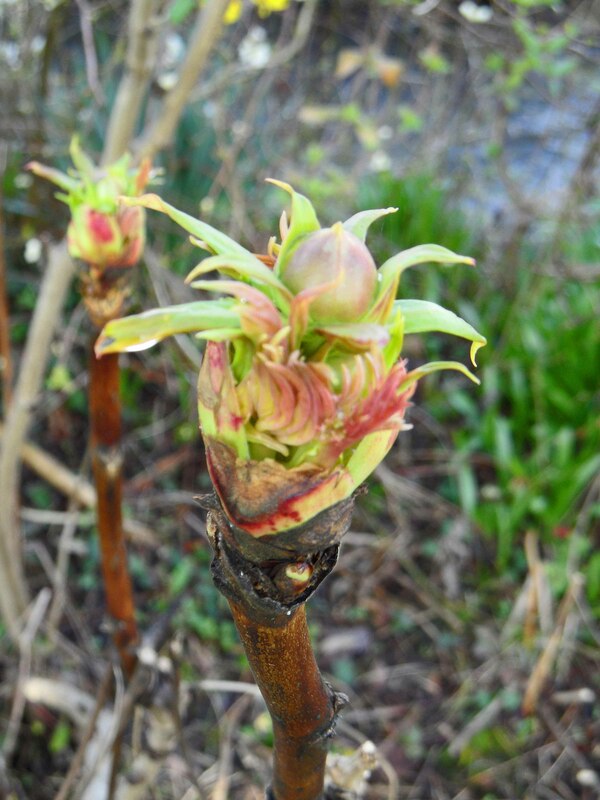 And just along from the magnolia, the big, fat, unfurling buds of the Paeonia ludlowii var lutea. This was a purchase back in Scotland from Dougal Phillip’s nursery outside Linlithgow. Which, by the way, has a really good tearoom, albeit no longer in the walled garden of Hopetoun House, soup and a cheese scone, fantastic. But back to the paeony, it was in a ‘lost and found’ section, for desperate, homeless plants that had lost their tags, and their looks temporarily. So, for £3 a total snip. It is a stately plant. It may take some time to get going, but when it does, from the fat buds you get gorgeous papery bright yellow flowers and the most refined, dissected, bright emerald green foliage. in fact, it would win for the foliage alone. 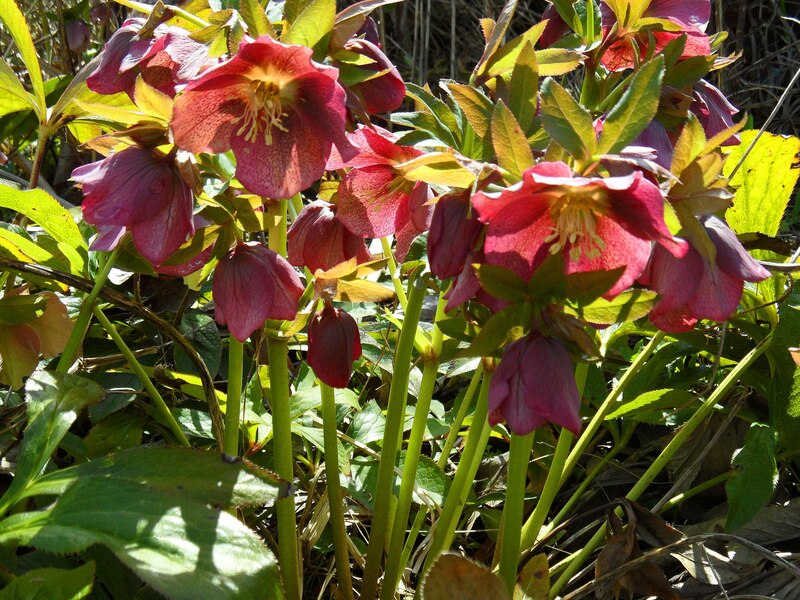 And then I turned round, and the sun had backlit my rather muddy coloured deep pink hellebores, and I had to breathe out. Really lovely. And now, it’s raining again!